BlackBerry and TCL generated plenty of intrigue when they announced the KeyOne at Mobile World Congress in February. It’s always refreshing to see alternatives to the traditional all-screen smartphone design, and not many phones in this price range are still willing to offer a physical keyboard. There’s certainly a market with people longing for physical keyboards, even if it’s small, and the Android-powered KeyOne is a great choice. TCL is manufacturing the phone, but BlackBerry is in charge of software and updates — it’s all a part of the company’s new mobile strategy. If you’re worried, don’t be — as we found in our BlackBerry KeyOne review, the smartphone has all the qualities of traditional BlackBerry phones, including excellent battery life and a priority on security. But the key selling point here is the keyboard, because, with its $550 price tag, there’s no other reason to buy the KeyOne. The BlackBerry KeyOne runs against the current trend of wafer-thin phones with oversized screens. It’s thick, bulky, and has a smaller 4.5-inch display. We wouldn’t call it ugly, but the top edge that houses the front-facing camera and LED indicator looks a little dated, the backlit keyboard is too glossy for our taste, and the two-tone front isn’t especially attractive, either. Still, the phone is clearly designed for enterprise, and it just looks as though it’s meant to be a productivity workhorse. TCL has done a sound job in retaining the familiar look of previous BlackBerry-made flagships. Still, it’s something different. We like how the top is flat with sharp corners, but the bottom is more rounded. We haven’t seen a design like this before in a smartphone. The back is minimal, elegant, and the rubbery texture offers extra grip when handling the phone. There have been complaints about the back popping off, which we have yet to encounter, but BlackBerry is offering replacement units for those affected, and is also strengthening the adhesive on the KeyOne’s display. You’ll find the power button on the top left edge of the KeyOne, and the volume rocker on the right. Below the volume rocker, a Convenience Key acts like a handy trigger for your favorite app or shortcut. We wish Samsung would let us use the Galaxy S8’s useless Bixby button like this. A USB Type-C port on the bottom is surrounded by two speaker cutouts, but you wouldn’t know there’s more than one. Sound quality is only OK, and it doesn’t get loud enough for blasting music. Typing with a physical keyboard feels more satisfying. The capacitive navigation buttons above the keyboard are more nuisance than convenience. They’re easy to accidentally press when typing, and hardly offer any haptic feedback. They should have been placed below the keyboard, or TCL should have just opted for on-screen keys. The exceptionally well-built KeyOne feels like a brick — in a good way — as though it will be able to survive accidental drops easily. But fair warning: The keyboard seems to collect dirt between the key rows, and so does the bezel around the rear camera, so you’ll need to clean them often. By packing 1,620 x 1,080-pixel resolution into merely 4.5 inches, the KeyOne’s sharp LCD display hits an impressive 433 pixels-per-inch. It doesn’t seem to get as bright as we’d like, but we didn’t have too much trouble reading the screen in broad daylight. The weird resolution and screen size mean that videos play with giant black borders around them, making the content look really small. It’s watchable, but big-screen phones like the Galaxy S8 and LG G6 are much better devices for TV and movie fans. Playing games is a little awkward as well, because you’re ignoring a quarter of the phone. Heavy mobile gamers will want to look at the same alternatives. Performance is acceptable on the KeyOne, but we experienced the occasional stutter, and random app freezes. Switching between the KeyOne and the Google Pixel, we also noticed moving through the Android 7.1.1 operating system is not as fast or smooth on the KeyOne. That’s most definitely due to the less powerful Qualcomm Snapdragon 625 processor powering the KeyOne, as opposed to the Snapdragon 821 on the Pixel. As a reference, here are a few benchmark scores. The Moto G5 Plus, which uses the same processor, scored a 463 in the 3D Mark test, and 63,190 in AnTuTu. The KeyOne scores negligibly lower, but you should expect comparable performance. We managed to play games like Tiny Archers, and Alto’s Adventure with no problems — and the device hardly got warm. We would have still liked to see a better processor, considering the Moto G5 Plus has the same chipset and costs under $300. There’s 3GB of RAM in the KeyOne, which is on par with many devices in its price range and it should be enough to handle multitasking. You also get 32GB of internal storage, and there’s a MicroSD card slot in case you want to add more. As of September, TCL is offering the BlackBerry KeyOne Black Edition in select markets. Not to be confused with the Space Black version available exclusively from AT&T, the Black Edition is more than just a color makeover — it sports 1GB of extra RAM, taking it to 4GB, and 64GB of internal storage, instead of 32GB. The bad news is that it’s limited to Europe, Japan, Canada, and parts of the Middle East for now. The KeyOne runs the latest version of the Android operating system, 7.1.1 Nougat, and it’s fairly close to stock. Like a Motorola phone, there are some design changes, but you’re overall getting a look that’s close to what Google established on its Nexus devices. One improvement is a Recents button that brings up a grid-layout of recent apps, rather than Rolodex-styled vertical cards (you can change this to whichever you prefer). You can even install icon packs from the Google Play Store with the default launcher. KeyOne feels like it’s built to withstand the apocalypse. The KeyOne is all about choice. You can choose what to trigger with the Convenience Key, you can use the LED notification if you want, and best of all, you can customize shortcuts for every key on the keyboard to open any app — there’s hardly a need for the app drawer. These are intuitive, simple to configure, and one of our favorite features of the KeyOne. Long-press the G key to open Gmail, for example, and you can set a short-press to open Google. There are even more specific shortcuts, like “write a note,” but these seem to only work with BlackBerry-specific apps. Speaking of which, there are a lot of pre-installed BlackBerry apps, like WorkSpaces, a Google Drive alternative; the famous BlackBerry Messenger; BlackBerry Hub, which shows all your notifications in one place; Password Keeper, which stores your passwords in one secure location; and more. Some of these apps are genuinely useful, and it’ll come down to preference if you want to use these over your traditional favorites. You can disable these apps if you don’t want them, but you can’t uninstall them. Similar to Samsung’s Edge panel, BlackBerry has a Productivity tab you can drag out from the right edge of the screen, and it offers quick access to your calendar, Blackberry Hub, Tasks, and contacts. It mostly relies on you to use BlackBerry’s apps, but it’s still useful. There’s also the DTEK By BlackBerry app, which monitors your device security by continually performing a safety check. It scans every app you install for malware, and recommends certain steps to keep your device safe, such as using a screen lock. You can even see detailed information on what permissions apps are using, and when. Best of all, BlackBerry is promising to deliver on Google’s monthly security updates, and it’s one of the few Android manufacturers following through. The KeyOne presents an excellent, thoughtful Android experience for BlackBerry fans that are reluctant to hop on the company’s latest smartphone, or just anyone seeking an Android smartphone with a physical keyboard. The keyboard is the reason you’re buying the KeyOne, and it’s excellent. Typing will take longer than a day or two to get used to, but we found ourselves typing more accurately, especially since the built-in autocorrect is reliable. We experienced the occasional stutter, and random app freezes. In most apps, a predictive bar pops up above the capacitive buttons with useful suggestions that make typing quicker. Pro tip: You can swipe up on the left, center, or right side of the keyboard to choose the predicted word, saving you an extra step. You also don’t need to rely on emoticons over emojis — tap and hold the button left of the spacebar to activate keyboard settings. A bar will pop up above the predictive words, allowing you to choose Android emojis, paste from your clipboard, access the keyboard settings, and trigger voice typing. Tap Alt to use numbers and symbols, and double tap it to continually use them. The same applies to the Shift key and Caps Lock. You can also use the keyboard to swipe and scroll through screens — it works pretty well, but we prefer the touchscreen. The spacebar doubles as a fingerprint sensor — you don’t need to press it down, just place your fingerprint over it and it unlocks your device quickly. We prefer fingerprint sensors on the rear, but had no issues with the KeyOne’s placement. You’ll most certainly need a few days to get used to the keyboard, so don’t dismiss it if you’re first impressions are mixed. After a week, our opinion was far more positive — typing with a physical keyboard feels more satisfying. Does it mean we’ll stick to physical keyboards from here on out? No, touchscreens are definitely faster, but it doesn’t mean the keyboard shouldn’t have a place. Looking for more keyboard tricks? Check out our handy guide. The 12-megapixel rear camera is surprisingly good. Our photos captured fine detail, and colors were fairly accurate, though the latter suffered in low-light. There’s no optical image stabilization, so you have to be very still when taking photos in low-light environments if you want to avoid blurry shots. Shutter lag is minimal. The standard camera app offers options for filters, HDR, and slow-motion video. There’s even a manual mode you can trigger in the settings, if you want more granular controls. The KeyOne’s camera’s only fault is autofocus; it seems take too long trying to focus on certain objects. We hope it’s fixed in an update, but regardless we’re pleasantly surprised by the camera. It’s no Google Pixel or Galaxy S8, but we believe most people will be more than satisfied with the outcome. The front-facing 8-megapixel camera is capable, best in broad daylight, but not noteworthy. The KeyOne’s battery will last longer than a Galaxy S8, and far longer than a Google Pixel, making it another standout feature. It’s all thanks to the 3,505mAh battery, the smaller screen, and the Snapdragon 625, which has excellent battery optimization, allowing for more than a day of battery life. With medium to heavy usage, we started with a fully charged KeyOne around 8 a.m., and consistently ended with 40 percent remaining by midnight. Most flagships smartphones end up around 30 or 20 percent by 7 or 8 p.m., but not the KeyOne — it’s a trooper. You most definitely can get a full day and a half with heavy to medium use, which includes watching a few videos, streaming music, browsing social media and news, and playing a few games. The KeyOne also supports fast charging through a specific mode that pops up whenever you plug in a charger. You can choose to charge the device like normal, but Boost Mode will essentially put your phone on airplane mode so it can charge faster. The BlackBerry KeyOne comes with a standard one-year limited warranty that covers manufacturing defects. Accidental drops and water damage are not included under the warranty. It’s priced at $550 unlocked in the U.S., and is sold in two unlocked configurations: one for GSM networks like AT&T and T-Mobile, and one for CDMA networks like Verizon. If you want the phone a little cheaper, you may be able to if you purchase it from Best Buy or Amazon. For a limited time only, BestBuy.com, select Best Buy stores, and Amazon are offering the GSM and CDMA variants of the phone for $450 — $100 off its regular retail price. The sale will run until supplies last but officially ends at 9:59 p.m. PT on December 24. At launch, the KeyOne could only be bought in a combination of black with silver trim. AT&T now offers a special Space Black color that’s exclusive to the carrier. Although it looks exactly the same, it’s not to be confused with the higher-spec Limited Edition Black variant manufactured by Optiemus Infracom and released in India earlier in August, or the TCL-manufactured Black Edition that hit Europe, Canada, and a few other markets in September. Those devices have an extra gigabyte of RAM for a total of 4GB, as well as double the internal storage, at 64GB. 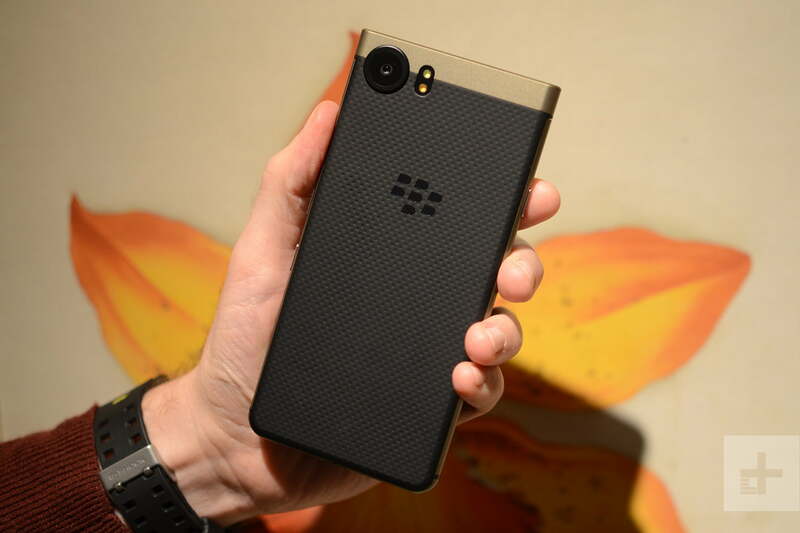 A bronze version of the KeyOne is also available in select international markets — it was announced at CES 2018 — and it adds Dual-SIM capabilities to the phone. BlackBerry’s KeyOne offers an excellent keyboard, where every key can act like shortcuts for apps and actions. It has more than a day of battery capacity, and is equipped with a capable rear camera. Our only issues are the KeyOne’s occasional performance hiccups, as well as the high price tag in relation to its specs. Yes, there are devices with similar specs and lower price tags — such as the Moto G5 Plus or the Moto Z2 Play. But the reason BlackBerry and TCL can get away with the KeyOne’s $550 price tag is because there are hardly any smartphones with good keyboards. If you’re worried about durability, the KeyOne feels like it’s built to withstand the apocalypse. BlackBerry is also promising monthly security updates, and we hope that extends to Android version updates. We expect this phone to last two to three years in terms of updates, and longer for durability. It’s not water-resistant, so be careful to leave it behind before going for a swim. Yes. Want a physical keyboard? The KeyOne is one of few options, but it’s great. The keyboard is chock-full of handy features, the phone will last you more than a day, it has a relatively clean software experience, and it’s secure thanks to the company’s promise of monthly security updates. Update: Added news about the BlackBerry KeyOne bronze color option that also has a Dual-SIM slot.